Lisa T. Bergren is a well-known author of many books. 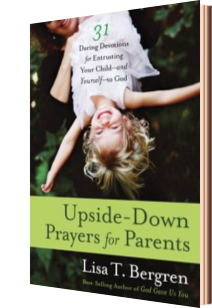 I have enjoyed her children's books, so decided to choose this new one she wrote for parents called Upside-Down Prayers for Parents. The book includes 31 devotions to help parents entrust their children to God’s love and care, in way that you would not normally expect. Each devotion has a Scripture verse, thoughts from the author about a specific area to pray about for children, a suggested prayer, and an area to answer a question or reflect on what you have learned. It also includes a discussion starter to use with your children such as, in devotion #11 which speaks about loneliness and finding intimacy with the Lord, "Have you ever been lonely?" and "How do you see God around you?" I pray you’ll get caught doing things wrong - and find the good and true path. I pray you’ll fail in things that don’t matter - and learn to seek what matters to God. I pray you’ll experience unanswered prayers - and you'll find a deeper trust in Him. I pray you’ll know fear - and find courage in living with God beside you. WHEN you do things wrong, I pray you will get caught. I would not say to forego this book all-together, as it does have a lot of good thoughts. But, just wanted to mention this one area I didn’t agree with. If anything, it wouldn't hurt to pick it up just for the conversation starters to have with your children. NOTE: I received this book free of charge from WaterBrook Multnomah Publishing Group for review purposes. The opinions expressed are my own. Set to be released on February 19th. My Cancer Journey - Part 9: Why Me? ?